With its centuries-old baroque buildings, timeworn paving stones and elaborate stairways, Via Crociferi is unashamedly photogenic, so much so that a number of Italian films have shot scenes on its sidewalks. 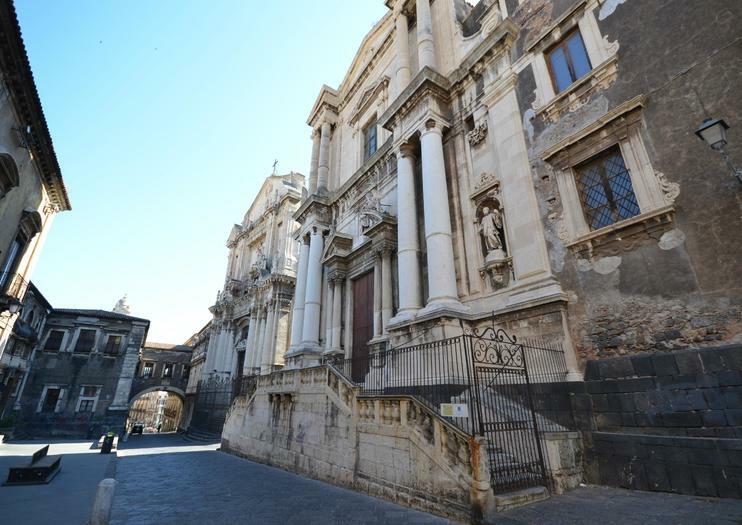 Walking the length of Via Crociferi is like taking a stroll through the city’s history, starting at the south end of the street, where the Parco Archeologico Greco-Romano di Catania is home to the city’s most notable Roman ruins and the medieval Castello Ursino towers in the distance. Via Crociferi is most famous for its Sicilian Baroque architecture and its striking churches and 18th-century palazzi form an important part of Catania’s UNESCO World Heritage site. Highlights include the Arco di San Benedetto, the iconic archway which marks the start of the street and dates back to 1704; the Church of San Giuliano, designed by architect Giovan Battista Vaccarini; the dramatic portico of the Jesuit College; the magnificent Villa Cerami; and the Vincenzo Bellini house museum. Via Crociferi runs from Convento dei Crociferi to Piazza San Francesco d’Assisi in central Catania.